About | High School Can Feel Like An Alien World. ALIENATED is based on the leaked memoirs of Sherman Capote, the only human boy in the high school at Area 51. To save the world from total destruction, the only human boy in the high school for aliens at Area 51 must convince the most beautiful girl in school, an omnipotent deity, to be his date for Prom. Better at building rockets than relationships, Sherman Capote lives on an air force base in Germany with his father, an Air Force general, and his sister Jessica, the resident drama queen. To mark the first anniversary of his death of his mother, an army nurse who had always wanted to be an astronaut, Sherman builds a rocket and launches her ashes into orbit, causing an international incident. For security reasons, NATO moves the entire Capote clan to a secret base at Groom Lake, Nevada. When Sherman and Jessica enroll at Groom Lake High, they are the only humans at Area 51’s high school. Not all the alien students are happy about their arrival, but as Sherman gets a handle on the complex social hierarchy of high school, he begins to make friends: a sarcastic Ventitent (a twenty-tentacled “octopus”), a moody robot who used to be humanoid, and a feisty pink lizard who rejects her tribal roots. And he falls head over heels for the most gorgeous girl in the school, an omnipotent deity who, inconveniently, exists on many worlds simultaneously. Sherman makes a few enemies too. The conceited NED (a Non-Earth-Deity) is doing his time on Earth when he discovers that the planet’s core is made up of the most delicious, addictive form of liquid magma, the life-blood of his home planet. When he alerts his people to his discovery, they immediately plan an invasion to drain Earth of its precious liquid core so causing the planet to collapse in on itself. Earth will be destroyed unless Sherman and his friends can stop them. They devise a plan so foolproof that it’s bound to go spectacularly wrong. The key to its success is Juliet. Sherman must muster the mojo to convince Juliet to be his date for Prom because as long as she remains on Earth, she will keep the NED invasion at bay. But can romance based on world-saving trickery ever truly last? 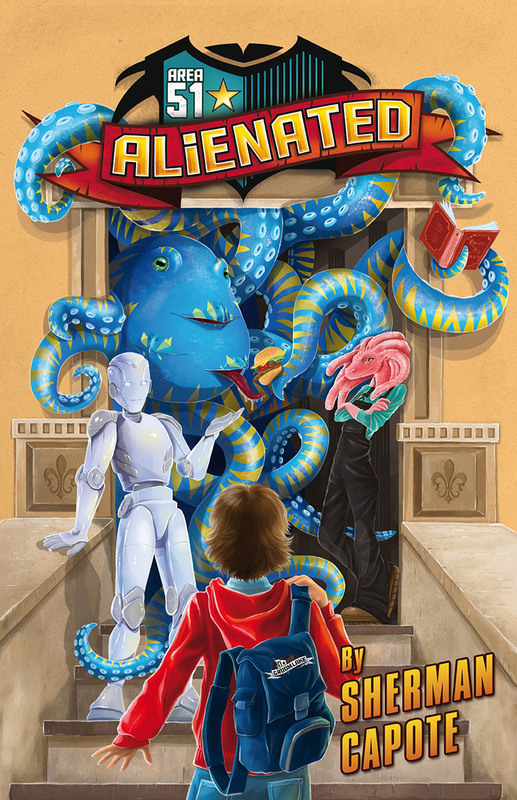 ALIENATED is an adventure set in the most hostile place in the universe: high school.